A Kordes rose released in 1970 Tatjana is a rose that has stood the test of time and is still very popular. 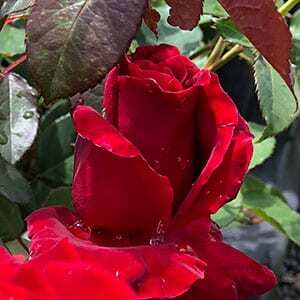 Large deep red flowers that have good fragrance and also make good cut flowers. Flowering from mid spring right through until autumn this is a hardy rose, vigorous growth habit and with good disease resistance. Pick the flower for a vase when the buds are just about to open and they will open in the vase lasting for many days. You could plant Tatjana in a rose garden, in a container, or use it mass planted as a border. It will produce masses of flowers and fill the garden with fragrance on a warm day. Good mid to deep green foliage on an upright bushy plant and an easy to prune nature make this a winner. We suggest using a general purpose rose food such as Sudden Impact for roses with an application every 8 weeks from early spring through summer. Regular seaweed fertiliser application will also help keep you Tatjana Rose Bush flowering freely.